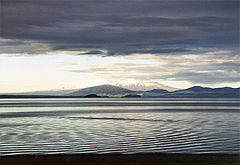 With a surface area of 616 square kilometres (238 sq mi), it is the largest lake by surface area in New Zealand, and the largest freshwater lake by surface area in Oceania. It is drained by the Waikato River (New Zealand's longest river), while its main tributaries are the Waitahanui River, the Tongariro River, and the Tauranga-Taupo River. The lake lies in a caldera created following a huge volcanic eruption (supervolcano) approximately 26,500 years ago. It has predominantly erupted rhyolitic lava although Mount Tauhara formed from dacitic lava. The largest eruption, known as the Oruanui eruption, ejected an estimated 1,170 cubic kilometres of material and caused several hundred square kilometres of surrounding land to collapse and form the caldera. The caldera later filled with water, eventually overflowing to cause a huge outwash flood. Several later eruptions occurred over the millennia before the most recent major eruption, which occurred in 180 BC. This was one of the most violent eruptions in the last 5,000 years (alongside the Tianchi eruption of Baekdu at around 1000 and the 1815 eruption of Tambora), with a Volcanic Explosivity Index rating of 7. 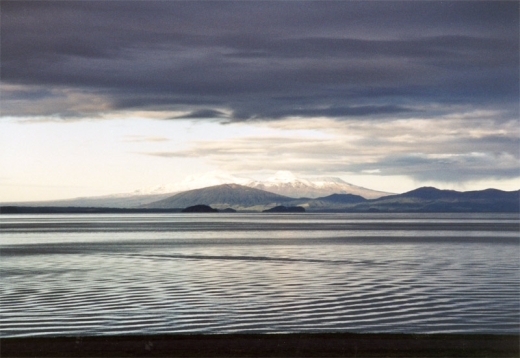 The area was uninhabited by humans at the time of the eruption, since New Zealand was not settled by the Māori until several centuries later at the earliest. 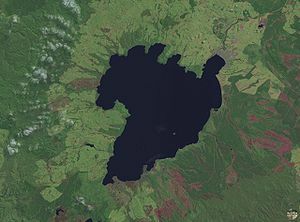 Taupo's last known eruption occurred around 210 BC, with lava dome extrusion forming the Horomatangi Reefs, but that eruption was much smaller than the 180 BC eruption. Much of the watershed of Lake Taupo is a beech and podocarp forest with associate understory ferns being Blechnum filiforme, Asplenium flaccidum, Doodia media, Hymenophyllum demissum, Microsorum pustulatum and Microsorum scandens, and some prominent associate shrubs being Olearia ranii nd Alseuosmia quercifolia. Native faunal species in the lake include northern koura or crayfish (Paranephrops planifrons) and kokopu or whitebait (Galaxias species). The lake is noted for stocks of brown trout (Salmo trutta) and rainbow trout (Oncorhynchus mykiss), introduced from Europe and California respectively in the late nineteenth century. There has also been a subsequent introduction of smelt (Retropinnidae species) as a food for the trout. Tourism is a major business for the area, attracting over 1.2 million visitors per year. The fact that the lake is the largest fresh water lake in Australasia (and sometimes advertised as the largest in the southern hemisphere), and approximately the same size as Singapore, ensures its popularity. The busiest time is the high summer season around Christmas and New Year. The lake area has a pleasant temperate climate. Maximum temperatures range from 24°C in January to 15°C in July, while the night temperatures range from 16°C in summer down to 5°C in winter. Most rain falls in summer. The area hosts popular events like the annual Lake Taupo Cycle Challenge, a cycling tour around the lake. Going around the lake takes about four to ten hours, depending on the cyclist. Hundreds of volunteers from the Taupo township help out to ensure the event's success. Taupo is also host to the Oxfam Trailwalker, a charity ultra-challenge held each April on a 100 km course. The region is also famous for the sport of skydiving. NASA satellite photo of Lake Taupo.